Since most of the game documenation is in-game. ideas are from select game genres I grew up with. flag + shooter + rockem sockem. 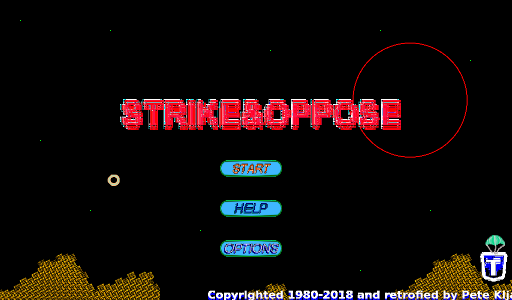 intentionally, Strike&Oppose is meant to be a push game. is destroying the enemy tank all-together(rockem sockem). bonus of two-ways in lieu of one. will be done differently than normal PC mouse operations. a button is pressed when it's most relevant. First one to reach the finish line wins. have no effect on most surrounding enemy ships. weapons can destroy most surrounding enemies. must be realized by the player. city defenses. One will be for missile attacks. 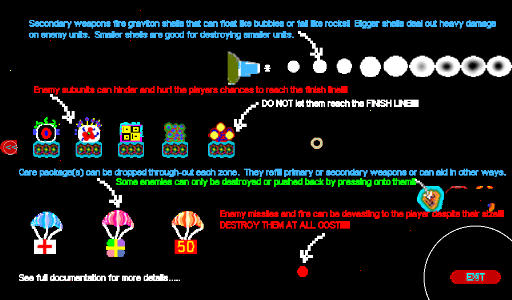 destroyed or depending on the game mode. difficult and '3' being very difficult. EMP burst's expansion. Afterwards, no more build up. a zone then the EMP expansion is set back to '1'. Which is the size of the 'O' cursor. considerably without consideration to the player's victory. 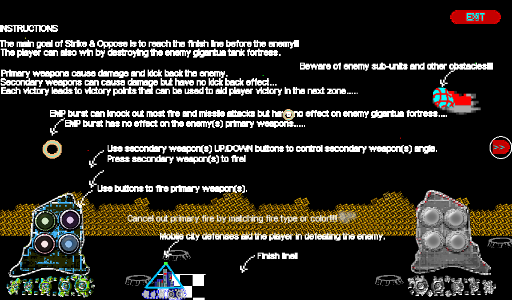 option along with the closing walls option. the mobile city defenses will be reversed. be used to buy the player's primary weapon's pulses. defense base that creates them.. Victory points will also float away faster than others. the more it gives when collected. FPS is meant to be 30 FPS if enabled. 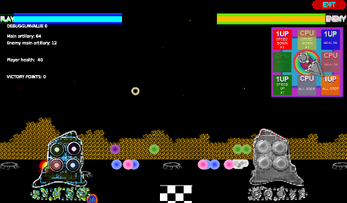 some of the enemy's obstacles. 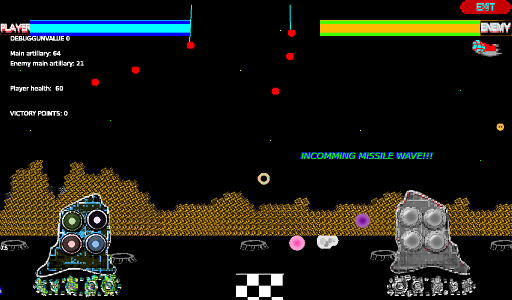 MISSILES: are red and will leave a streak upon burst. they are destroyed with EMP burst in general. 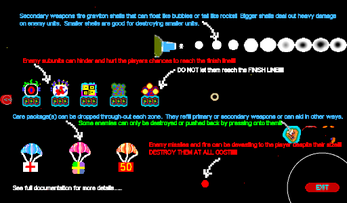 with EMP bursts or 'O' cursor will stop them. 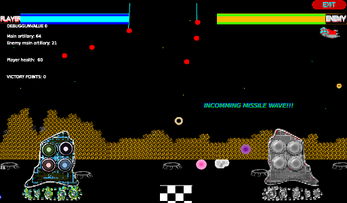 it with EMP blast's before it leaves the playfield. own penalty. So, penaltys can happen in multiples. These units are destrpyed with EMP blast. '1' is the basic spinner setup. '2' is half and half. intentionally set to be very easy from the 1st zone. normal settings before playing with other options. NOTE: Switching between 'O' and 'X' cursor!!! 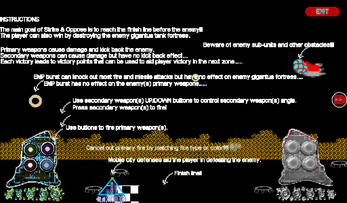 timing, the player can shield the tank from damage. reset replaying a zone lost. NOT conform to the standard HTML5 practices. CHROME or FIREFOX on smaller devices. I do not specialize sound for multiple browser formatting. browser's standards. I've had great results with CHROME. *Sound is 44k Monaural for retro reasons..
*Animation and effects are made around retro-effects. Therefore, everything is intentionally reduced. concepts are blended into this project. *Strike&Oppose does NOT use HTML5 hardware(WEBGL) support. so that it works on any browser that has basic HTML5 support. when using a higher skill level. identifier to be left after destroyed.. 1.)Download. 2.)Unzip. 3. 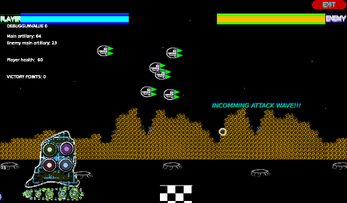 )Play in your browser.